As the capital of Thailand, Bangkok is home to millions of locals and expats. With millions of tourists also flocking to the city each year, Bangkok can get incredibly busy. Before heading to the capital, you should have an idea of modes of transport to help you navigate your way. Here are five ways to help get you around Bangkok, enabling you to explore the magical sights and attractions of the city. One of the easiest and quickest ways to travel around Bangkok is by using the BTS Skytrain. The train runs on two lines, the Silom Line and the Sukhumvit Line, which link Bangkok’s business districts covering much of the city. If you are staying in Silom or Sukhumvit, using the BTS will help you get around the city and avoid traffic jams. Tickets for the BTS Skytrain start from 15 Baht, so it’s best to check the BTS pricing table before you travel. 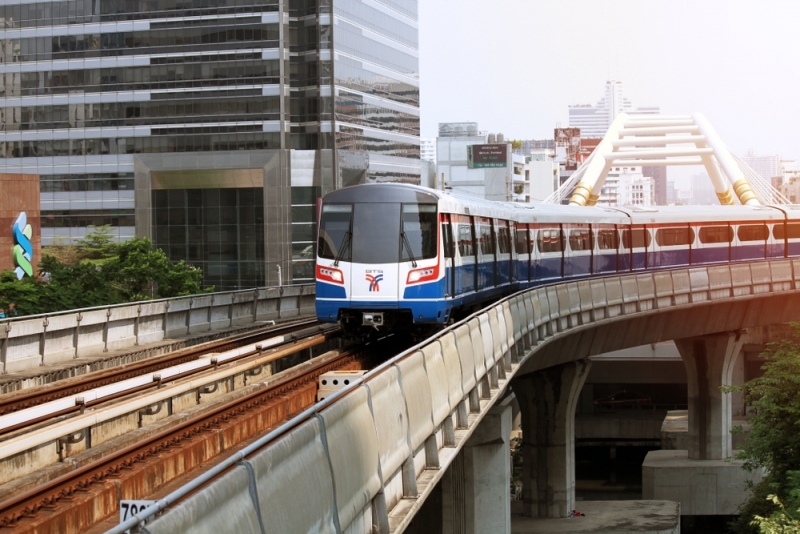 If you are staying in the northern section of Bangkok, the most convenient mode of transport would be to take the Bangkok MRT. The MRT covers Bangkok’s northern section and connects with the BTS at Sala Daeng, Asok, and Mo Chit stations. It’s important to note that tickets for the MRT are not sold with the BTS, so if you are traveling with a Rabbit Card, you will need to buy a separate ticket when at an MRT station. While Bangkok may be infamous for its busy roads and traffic jams, traveling around by taxi can be surprisingly cheap and fast, helping you explore the city with ease (depending on the time you choose to travel). Most taxi drivers in the city will not speak English, so it’s wise to write down where you are heading to, which you can hand to your driver. Try and avoid using a taxi during rush hour, especially if you are located near to the BTS. If a short distance journey is all you need to do, you may benefit from taking a motorcycle taxi, which is a convenient and quick option. You can find motorcycle taxis located near MRT and BTS stations, as well as outside attractions and shopping malls. If you would prefer to ride on your own bike, make sure that you check out places where you can rent bike in Bangkok. While tuk-tuks may look cool and seem fun to travel in, they are best avoided. Tuk-tuks can be loud and uncomfortable (not to forget the aggressive pricing). Although they can be a fun and different experience to try out, it’s recommended you stick to other modes of transport. Whether you take the BTS Skytrain, jump in a taxi or even get around yourself on a bike, there is so much to see and explore when in Bangkok. For taxis especially, make sure you have a rough idea of how much the journey will cost you to avoid being scammed.